In order to give an idea of the camp, as many photos as possible we have compiled. Some show the former camp, others give you an impression of the today's state. A photo says more than most other sources. Source: ARC archive, if nothing else is mentioned. This photo was taken on 22 August 1942 by the Austrian soldier Hubert Pfoch on his way to the front. 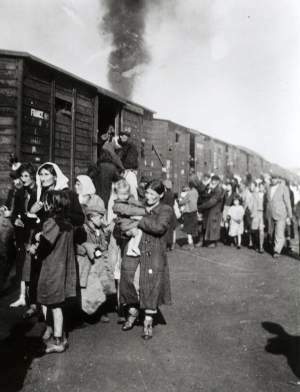 Jews being forced to enter the cattle wagons, waiting for them at the Siedlce station. 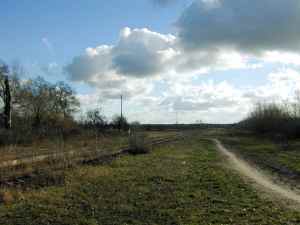 Destination of the train: Treblinka. 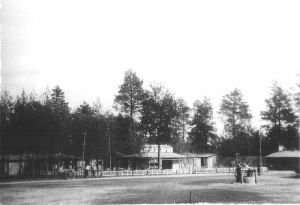 Hubert Pfoch saw the same train later, standing at Treblinka station. 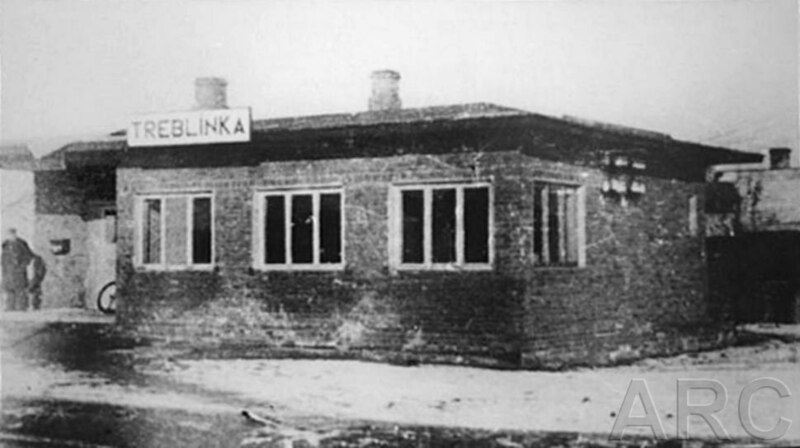 Famous photo, showing the small station building of the Treblinka village. Here all deportation transports were broken up, and shunted to the camp. 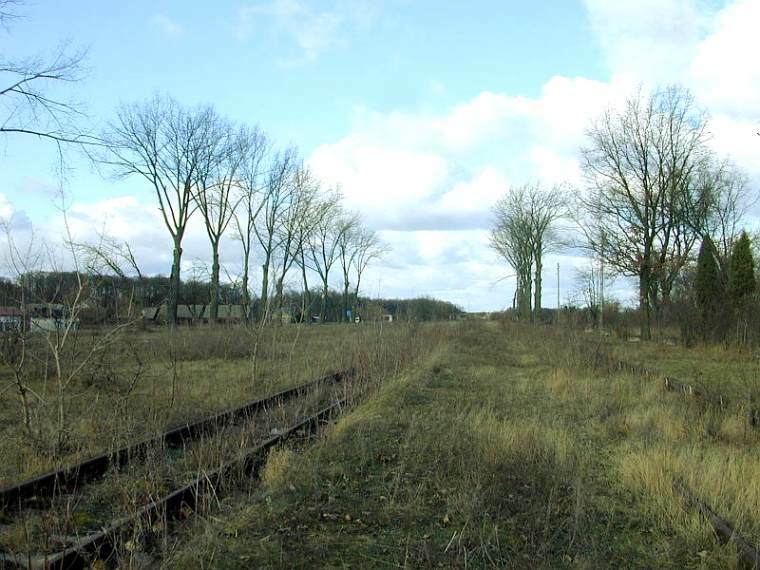 The station master Zabecki received all transport telexes, and stored them here. This brick building was built by the Germans, it replaced the old wooden one. 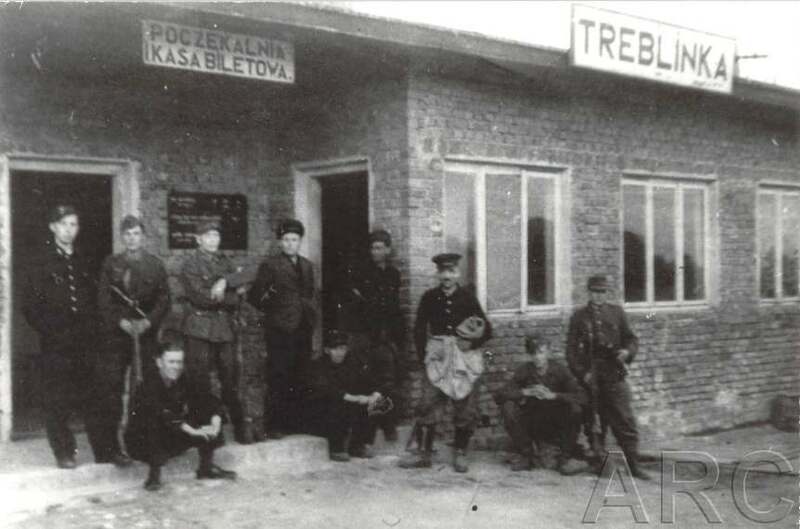 German and Polish railway personal at the station building. 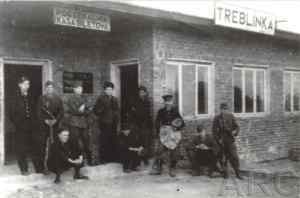 Treblinka Station, actually closed. Today the railway is used only for goods trains. The photo shows the view towards Malkinia and the Bug river. Here the trains waited before they were driven to the camp. The original tracks have been dismantled. The photo was taken in November 2004, by Igor Bartosik. View towards the former camp, and Sokolow Podlaski. Turn-off towards the camp. The former sidetrack has been dismantled. The former railway track through the forest is still visible. 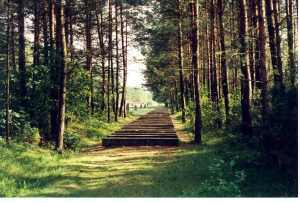 Today the railway track is marked by symbolic concrete sleepers. These photos are combinations of all available photos. You can see the "Upper Camp" where two or three excavators dug the large burial pits. 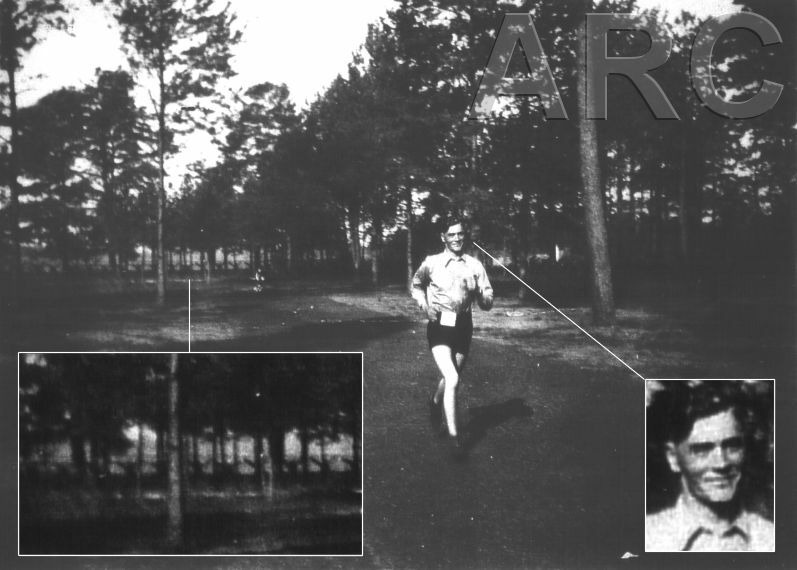 A combination of three photos taken by former camp commander Kurt Franz. On the left you can see the old gas chambers. 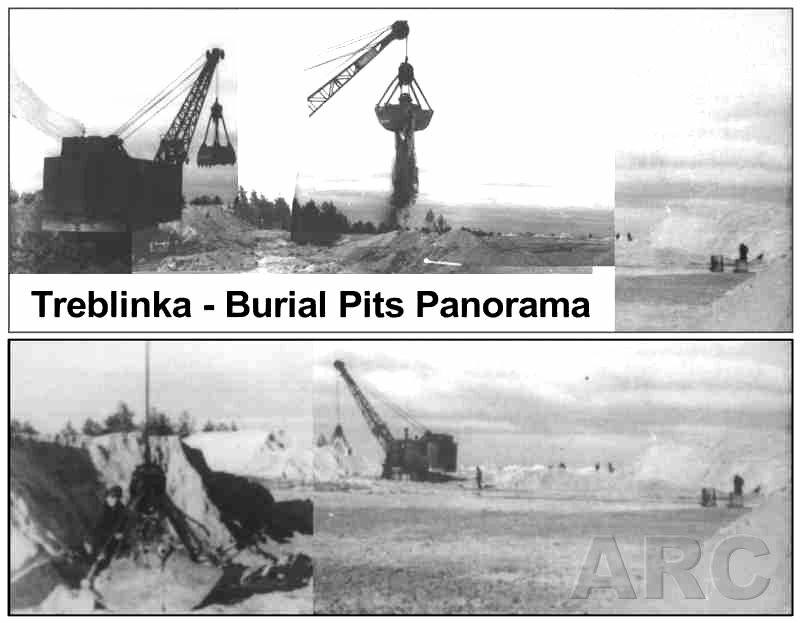 On the right the large burial site with sand heaps. 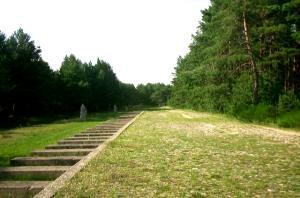 If Treblinka, the boards were added to the bodies in course of a test burning. Usually the victims were buried in mass graves, later cremated on roasts. 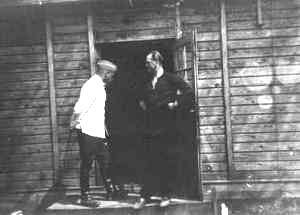 Camp commander Franz Stangl visiting Kurt Franz, who replaced him later. The photo shows the entrance of the commander's barrack, one of the two SS barracks or perhaps the barber's barrack. 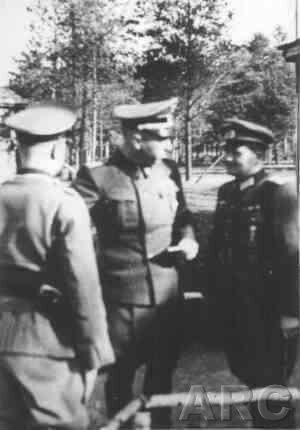 Camp commander Franz Stangl (in the middle) having a talk besides the SS barracks. A small part of the entrance gate is visible on the left. 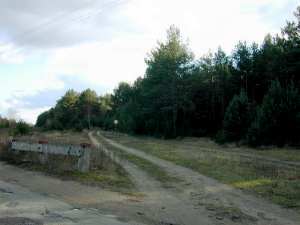 The small birch fences, built by Jewish prisoners, are typical for the SS and Ukrainian areas. A part of these fences is to be seen on the lower right corner of the picture. According to a statement by Münzberger the man with his back turned towards the camera is Willi Mätzig, while the Wehrmacht officer is Stangls friend, the young lieutenant from a non-German unit in Kossow (see also several statements in Sereny's book), with whom Stangl often drank (also on 2 August 1943). Münzberger seemed very sure about this, though he (in another statement) said that Mätzig never wore a gun in Treblinka - and as clearly can be seen, the man one can see from the back is armed, presumably with a revolver. 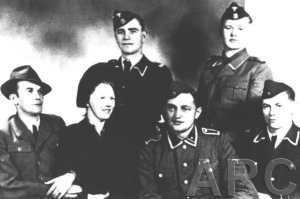 The photo was taken probably in 1943 because Stangl wears the SS peaked cap with the officer cord. 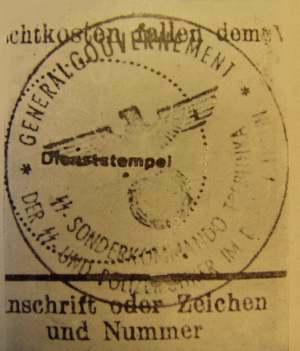 Until end of 1942 he wore a police uniform (Schutzpolizei - Schupo). Leisure-time activity. 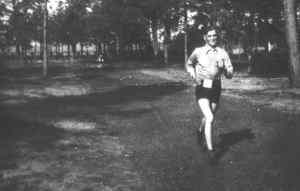 Wachmann Pinnemann, a Volksdeutscher, as competitor of a race along the camp border. Others used to drink in the beer garden or visited the camp "zoo". In the background the anti-tank obstacles are visible. This photo was taken in August 1942 when Pötzinger visited the Treblinka cook August Hengst and his wife Augusta in Warsaw. During an interrogation after the war Hengst told about this visit: He was allowed to wear civilian clothes, and he had an appartment in Warsaw where he often welcomed visitors from Treblinka. At this time Hengst was busy getting food and other goods for the Treblinka camp staff. From time to time he had to travel to Treblinka. One day camp commander Stangl forbade the wearing of civilian clothes. Anyway, when Pötzinger and Pinnemann were on visit this day, they had the idea to go to a photographer, which had his studio in the same road. There this photo has been taken. After the war West German policemen confiscated the photo during a search in Hengst's house in (probably) 1961. 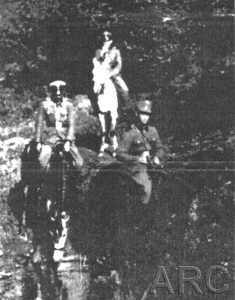 The photo shows unknown SS men, riding somewhere in the vicinity of Treblinka. 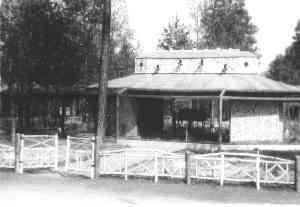 Besides the Ukrainian barracks the Jewish forced labourers had to build a zoo. There the perpetrators spent their leisure time sitting on wooden benches and tables. In the background the Ukrainian barracks are visible. On the left the Ukrainian barracks, in the center the zoo area, on the right the large potatoe mound and perhaps the Goldjuden barrack. In the foreground an inmate at the well. Four inmates are pulling a wooden cart. The new bakery, a brick building, was built where the Zoo Street led into "Kurt Seidel Street". 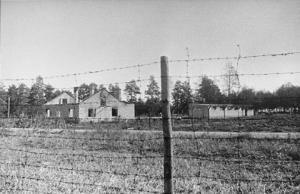 It was not put into operation until the camp was dismantled. Ruin of the new bakery. 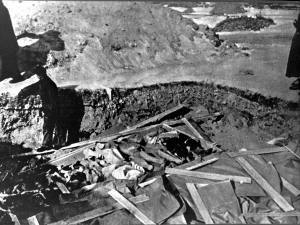 Photo taken in 1944 by Soviet soldiers after they occupied the camp site. Photo: Courtesy of Thomas Lofvenmark. This ammunition storeroom was located between the two SS barracks. 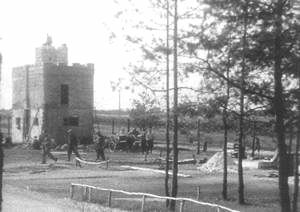 It was built during the first phase of the camp as a concrete cube. 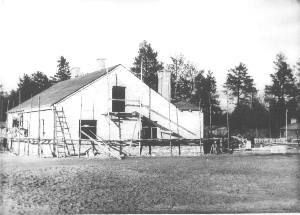 In spring 1943 a second storey was added, containing a watertank to supply new showers for the SS staff. During the revolt the SS barracks burned down. This photo was taken by Kurt Franz, after the revolt. 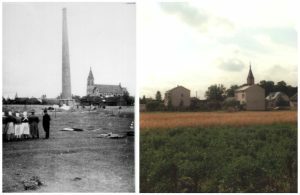 The photo on the left was taken in early autumn 1942 by Kurt Franz. SS man Erwin Lambert is working at the chimney in order to destroy it. 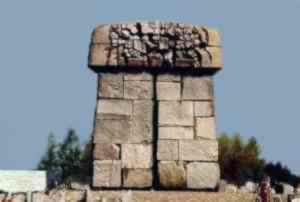 The bricks were used for building the new gas chambers of Treblinka. The photo on the right shows the site in summer 2002. 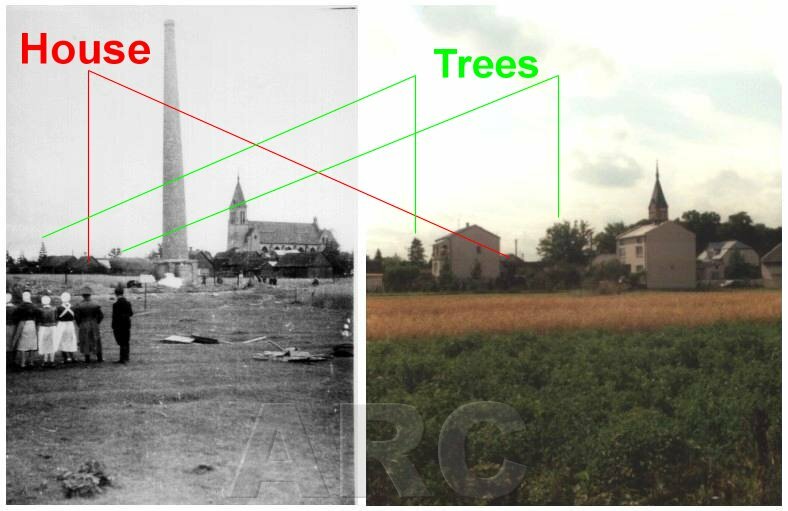 The trees around the church have grown, new houses have been built but the site where the chimney had been, remained empty. 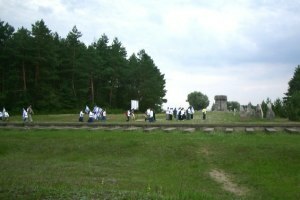 The large monument is located near the spot where the former "new gas chambers" were located. It is surrounded by thousands of symbolic tombstones. 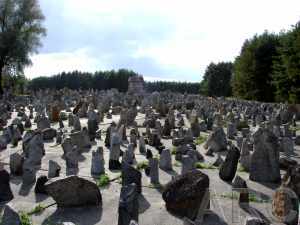 17,000 symbolic tombstones, representing villages (Shtetls), towns and countries from where the victims have been deported to Treblinka. Depending on the number of victims the stones differ in size and weight. In the background the large monument is visible. In the foreground the former ramp is represented by symbolic sleepers and a concrete wall. Line of view: East. From the background the trains entered the camp. The original ramp was located a bit more to the left. The former camp boundaries are shown by large stones (left).